Historic Brass Society - Holden, "And the Band Played On"
A considerable bibliography provides the scholarly reader with pointers for further research, while the lack of citations throughout the text assists Holden in creating an accessible and unhindered narrative of interest to the general public. The latter would seem to be the targeted audience, with the book selling at an accessible price in “regular” bookshops. ABC Classics has released an accompanying two-CD album of popular wartime music, attesting to its nostalgic appeal. 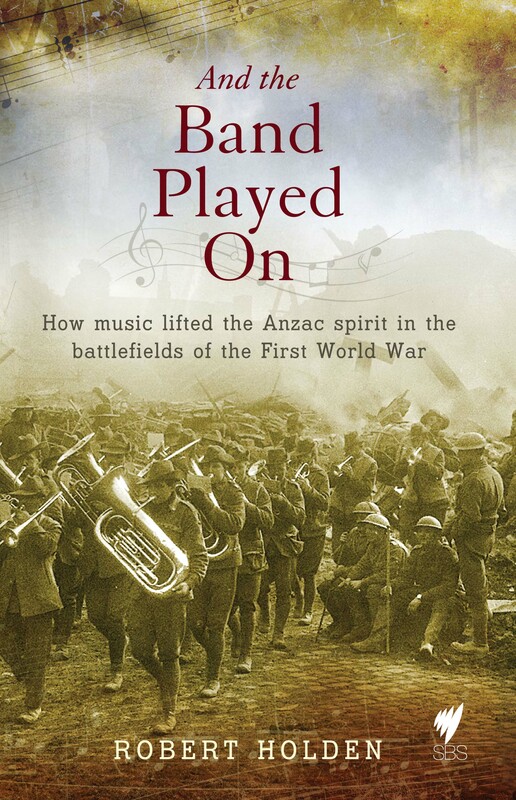 While the book’s title suggests that music—with its ability to uplift, console and distract—is Holden’s main focus, And the Band Played On actually presents a broader overview of the entertainment enjoyed by Australian and New Zealand soldiers during World War One. As Holden writes, “impromptu entertainments, singalongs, yarns and storytelling and recitations were all part of the homespun repertoire that accompanied these men to war” (p.10). In addition to the relaxing pursuits of singing popular songs and listening to the gramophone, Holden describes the more organized, semi-professional entertainments of concert parties, vaudeville comedy, pantomime, and Pierrot shows. As the book progresses, the reader is led further and further from the initial subject (music) when Holden devotes chapters to the soldiers’ tourist activities and their love of poetry, even exploring topics such as their weakness for gambling, love of sport, propensity for letter writing and diary keeping, and the production of newspapers and magazines. In this context, music becomes just one means of relaxation. In the fourth chapter, ‘The Band is the Soul of the Battalion’, Holden charts the importance placed on army bands early in the war effort, noting the influence of the public demonstrations of Britain’s Recruiting Bands Committee (which included Sir Edward Elgar and Rudyard Kipling) on Australians. In this chapter and elsewhere throughout the book he summarizes the diversity of bands that eventuated under the auspices of the AIF, and uses case studies to comment upon the nature and makeup of the bands, their performance activities, the emotional impact of music upon troops and civilians, the field duties required of bandsmen (such as being stretcher bearers), and so on. This book will be of value to those interested in the social function of music, particularly during wartime, and in music’s impact upon the psychological state of those in situations of stress. For those interested in music history it describes the diversity of musical styles that co-existed at the time of World War One and the many ways in which music was experienced. For those interested in the history of military music within the British Empire, Holden provides an accessible introduction to the formation, repertoire, instrumentation, performance activities, and performance and rehearsal conditions of buglers and bands during World War One. As he notes, “Sadly, band history is among the least researched areas of AIF endeavor” (p63). Hopefully this book will stimulate further scholarly interest.